Here’s the next in my Ways to Say series. Sometimes it’s just not enough to tell someone they are great. Or maybe you are a writing teacher and need another way to say “good job!” on a student’s paper. 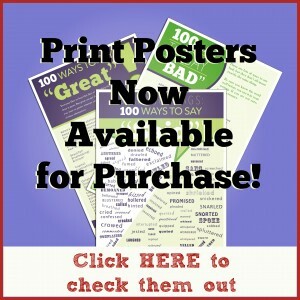 I’m hoping this list will help: 100 Ways to Say Great! I’ve included the list below and a shareable/pinnable poster version at the bottom. Feel free to share it! When a real poster version is available, I’ll announce it here on my blog. Leave your great comments below! Thank you very much for this eye opener. You are simply the best. keep up the good work. Thank you very much for this eye opener. You are simply the best. I am a content writer and addicted to this page. I regularly check for words that are often missing in my mind. your effort has created ease for me in word selection. Glad to hear it, Faheem. Thanks for taking time to encourage me. Oh, you’re cheating! There is no way to tell you how valuable this is that you haven’t thought of already. Consider it cut and pasted into my personal “Words to Use” file. My plan is to occasionally use a word/phrase from this list in response to student comments during our class discussions. My students have fun trying to figure out any words/idioms I use that they haven’t heard before. Thanks for this post. It will be useful indeed. What a wonderful (great! brilliant! spectacular! etc.) site. Just mentioned it as a source on MostlyMystery.com, a blog I share with four other authors. A suggestion for #101 is an expression I love. Not used as much recently and perhaps also a bit British but still an evocative word– top-drawer. Also, I’m curious why you left out “frabjous.” My go-to dictionary, thefreedictionary.com, redirects to “jabberwocky,” which I don’t like at all. But dictionary.com and oxforddictionaries.com both define it as “wonderful, elegant, superb, or delicious.” wiktionary.org includes the “great” word in its definition. So that brings it to 102 — yes? Thanks for this frabjous resource! Well, I didn’t leave out top-drawer or frabjous deliberately, Britt. I’m sure there are many I others I could have included. I just came up with 100 and stopped there — a nice, round number, you know? I love this! By chance, do you have a poster version of this I could purchase? Or perhaps a super high resolution jpeg that I could print? thanks! What a wonderful service. A Thesaurus so handy. Thank you for another superb list! I love your blog, Pinterest board, and Facebook posts. I really appreciate that you suggested this list as “…a great list for those looking for new ways to praise children…” As a homeschooling mom, I try to encourage, but sometimes words fail me. Thanks for all the suggestions here! Thanks for taking the time to write such an encouraging post, Paula. All the best in your homeschooling. Leave a Reply to joyous Click here to cancel reply.